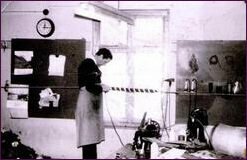 Welcome to ELLIS Ropes Ltd.
During the period 1950 to 1970 two people were the main ropes makers at J. Pritchard Ropes. Vic Wilson was the person who made the ropes and Alf Ellis cut and finished the ropes. J. Pritchards was then acquired by Mr. A Kilburn who bought the business from the Pritchard family and Alf decided it was time he tried to set up his own business. Pritchards continued to manufacture bellropes under the watchful eye of Vic and soon his son David was taught the art of rope making. Pritchards was then sold to a group who had other interests in the bell field and the manufacturing of the ropes was moved to the premises of John Taylor Bell Foundry. Alf started his business and called it Ellis Rope and Tents. At first he started a repair and manufacture service for tents of any size and shape. 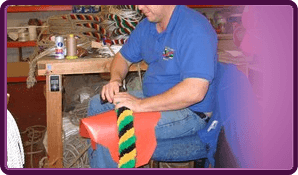 Then after renting a property which was suitable for making bellropes he produced the first rope in 1977. 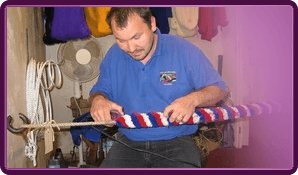 In the early 1980's Philip Alf's son in law started to learn the ropemaking side of the business. The business started to grow and in 1988 Alf bought a plot of land in Costock and built the present Rope Works, the business then started to operate under Ellis Ropes Ltd. In 2004 J. Pritchard Ropes Ltd was put into administration and the bellrope side was acquired by Ellis Ropes Ltd, and moved to The Rope Works at Costock. 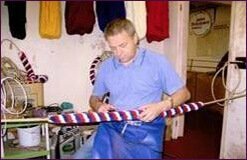 Today Vics son David is now making the ropes and Alfs son in law Philip cuts and finishes the ropes with Alfs daughter Carole, was the company secretary and now Phillips son in law Andy has joined the company, but sadly Alf, Carole and Vic are no longer with us. All Bell Ropes are now manufactured under the Ellis & Pritchards brand. 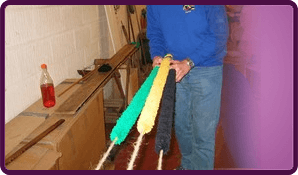 Although Alf and Vic are sadly no longer with us, the tradition of bellrope manufacture to the standards laid down by them still continues today.